How can schools re-envision their classrooms and campuses to make them more maker- oriented and, in the process, help students and faculty to develop the tools they need to better understand and effect change upon their physical environments? This is the essential question that we have been asking as we engage a number of Agency by Design’s Oakland Learning Community schools sites in the process of redesigning their school campuses using a simple design thinking process for master planning. The beauty of this effort has been the opportunities it affords both students and teachers to interact with, and actively recreate, the learning spaces that they occupy everyday. This is an iterative process that has no particular end state, but that serves to connect people to their environments, foster Maker Empowerment, and positively transform their school campuses in real and ongoing ways. As both an educator and a school architect with a longtime passion for inquiry- and project-based approaches to teaching and learning, I see the design thinking process as providing a perfect vehicle for this exploration. 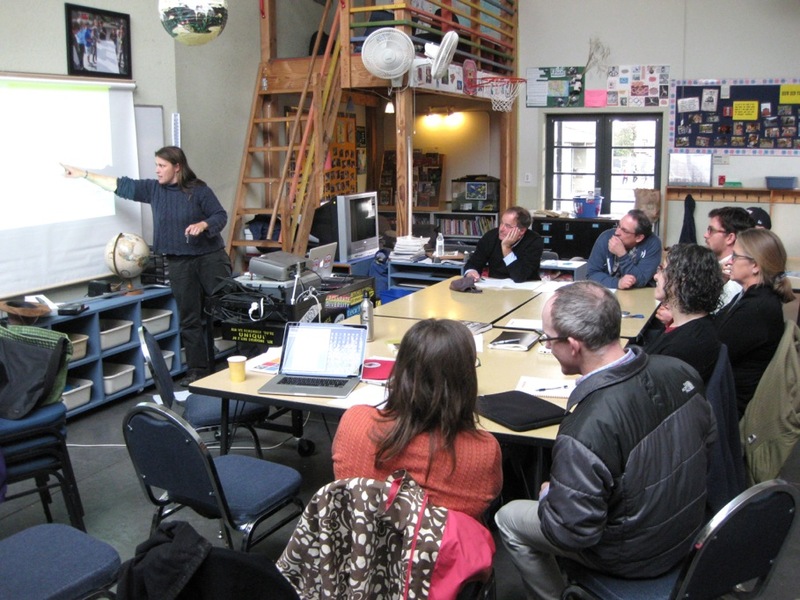 Through a series of workshops with selected groups of teachers and students, during the past nine months each participating AbD school has been working to clarify its learning goals and spatial needs as connected to maker-thinking and doing. This includes generating a list of Guiding Principles and Priorities for Design, identifying specific campus redesign and building projects that support these priorities, and engaging teachers and students in carrying them out. Articulating a safe, friendly, and clear entry sequence that strives to orient all building inhabitants and visitors to the school and campus as they enter. Creating consistent and clear branding and messaging platforms that communicate the values, learning goals, and priorities of the school. Fostering easy navigation and wayfinding to assist students, teachers, and visitors in making their way through the school building and campus. Showcasing visible learning and engagement through vistas into classroom and meeting spaces, as well as public art projects and installations. Establishing multiple venues for ongoing display, exhibition, and celebration of student work. 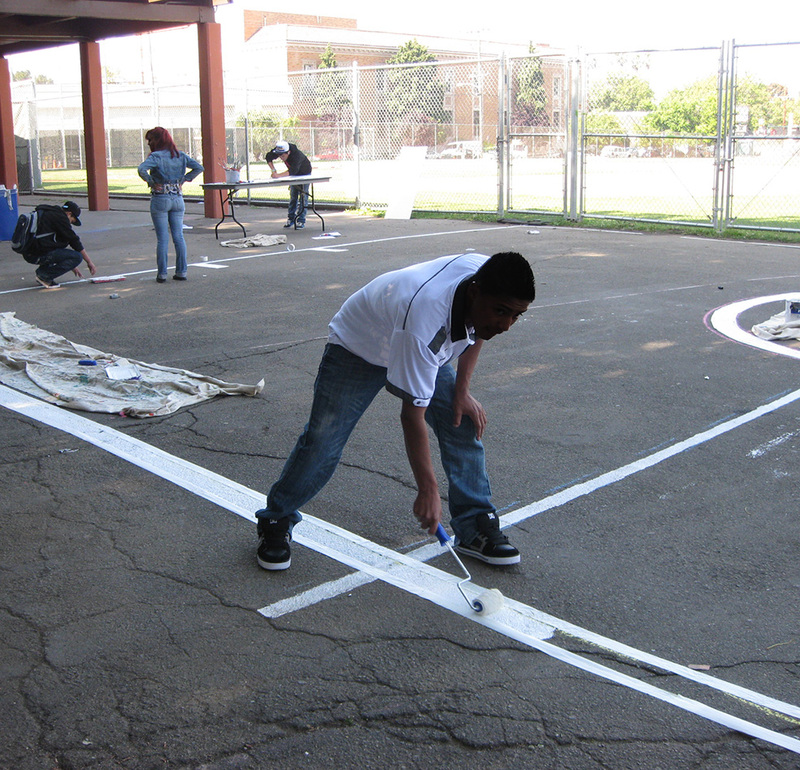 Defining classroom and neighborhood zones that encourage students and teachers to build a sense of ownership, identity, and connection across disciplines. 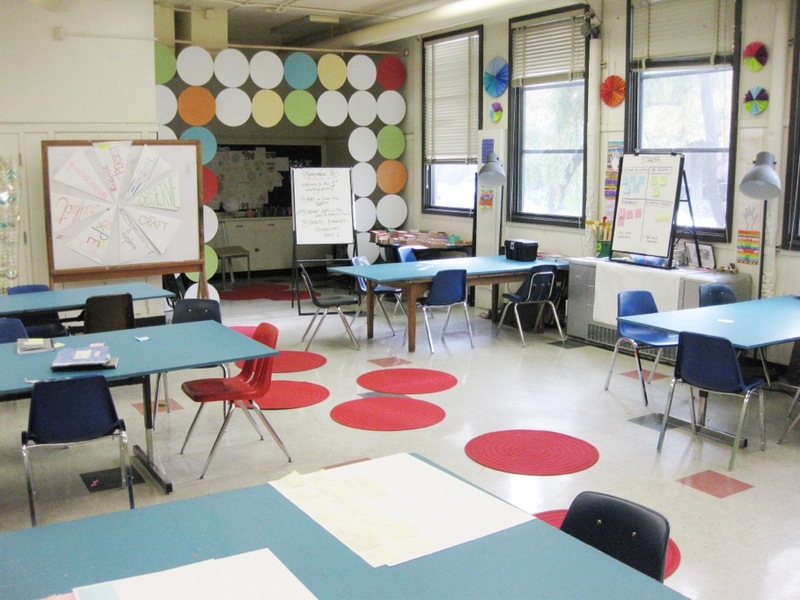 Designing and developing flexible classroom, gathering, and collaboration spaces that support large group, small group, independent, and project-based work. Provisioning flexible furniture and equipment that allow students and teachers to quickly transform their learning spaces and empower them as makers and doers. Developing outdoor learning spaces that promote maker activities and extend learning beyond the classroom. Initiating the development of Maker Spaces that support a range of design thinking and maker activities. Each of these focus areas is, in its own way, geared toward the creation of a more adaptable and dynamic campus environment—one that invites its inhabitants to think deeply about how they can use it, improve it, and leave their mark upon it. The creation of actual “maker spaces” that are specifically designed to house maker-, engineering-, and arts-oriented activities and programming, though only one part of each school’s Maker Campus Master Plan, is an important piece of the puzzle. Not surprisingly, these maker spaces have been assuming a variety of shapes and sizes. At Park Day School, an independent K–8 program, the maker space has taken the form of a detailed proposal for a Fab Lab that will be housed in three permanently situated shipping containers, surrounding a large outdoor maker courtyard and protected by an overarching industrial roof structure. At Claremont Middle School, a public 6–8 program, the Design Thinking and Making Lab has been located in the school’s former art room. The ongoing transformation of this Lab, and the Claremont campus as a whole, provides the focus for the school’s design thinking and making classes. 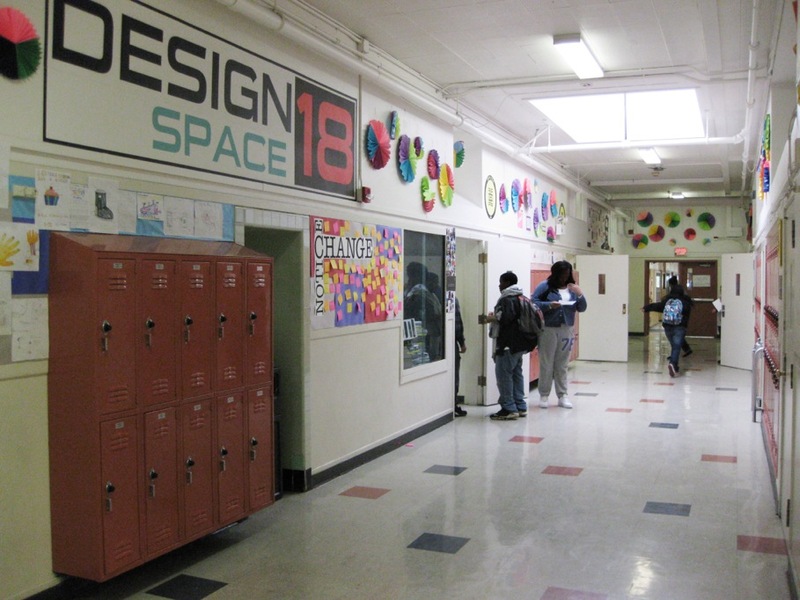 At Oakland International High School, a public 9–12 program with a large population of immigrant students, the school’s art room is also slated for conversion into a maker space. At the same time, equal attention is being placed on renovating the centrally located library and administrative area into a multi-purpose community gathering area, collaboration workroom, and computer lab. 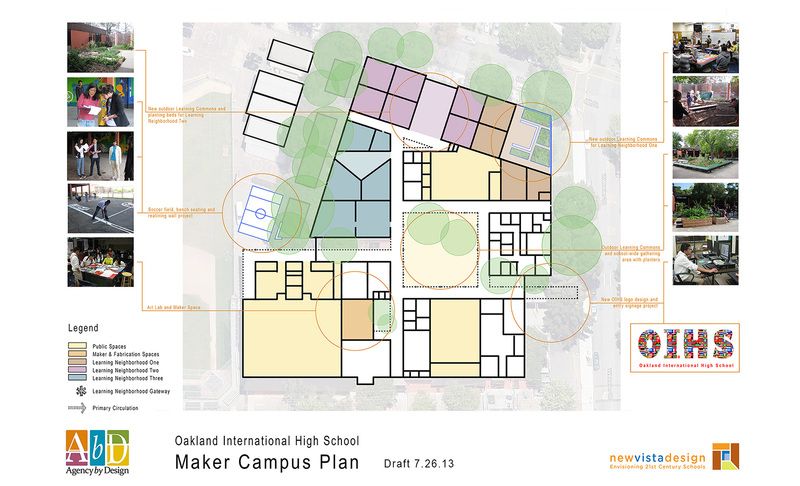 Many parallels can be drawn between the Maker Campus approach being taken by AbD’s schools and current school design trends that are surfacing on the national and international level. While until recently, the 19th century school building “typology” of departmentally organized and autonomous classrooms (double-loaded along locker-lined and institutional hallways) had remained the norm, the advent of 21st century technology and new models for teaching and learning are beginning to revolutionize the way we see school buildings. School districts and programs, and the designers they hire, are increasingly looking at school facilities as high-performance work environments that must adapt to the changing needs of their users, and a much larger range of instructional approaches. The notion of a Maker Campus is fully aligned with this approach. While thoughtful educational programming is always at the heart of a good school, its buildings and campus can go a long way toward facilitating the kinds of teaching and learning that take place there. While we don’t know yet how many of the creative campus changes envisioned within AbD school’s Maker Campus Master Plans will be fully implemented, it is my hope that the process of directly involving teachers and students in re-envisioning their campuses through design and maker-thinking practices has initiated a positive cycle of interaction and recreation that will continue long after the project is over! The question then becomes how has this process empowered students and teachers? David Stephen is a Boston-based architect and educator who works with schools, districts, charter management organizations (CMOs), architectural firms, and foundations across the U.S. and abroad to facilitate the design of 21st century, inquiry-based, and technology-rich school programs and the facilities that house them. This blog was published on November 25, 2013. Guest Author David Stephen is a Boston-based architect and educator who works with schools, districts, charter management organizations (CMOs), architectural firms, and foundations across the U.S. and abroad to facilitate the design of 21st century, inquiry-based, and technology-rich school programs and the facilities that house them.